Matheny School and Hospital was founded in 1946 and operates a special hospital, primary and secondary special education schools, day programs, group homes and an arts program, all focusing on children and adults with medically complex developmental disabilities. The focus of this needs assessment is primarily the hospital but our commitment to our patients, clients and students is multi-focal and interdisciplinary across the continuum of Matheny’s services. 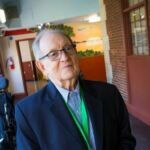 The specialty of the Matheny Hospital, located in Somerset County, is medically complex developmentally disabled patients. Community: Our community served is the population of people in the state of New Jersey with medically complex developmental disabilities. These disabilities may include: cerebral palsy, autism spectrum disorders, intellectual disabilities, processing/communication disorders, speech impairments, Down Syndrome, rare neurological disorders, mental illness, vision impairments, hearing impairments, traumatic brain injury, spina bifida, and fetal alcohol spectrum disorders. Collaborations: Information reported on in this assessment was gathered in collaboration with several other agencies serving people with disabilities in the state. Identification of prioritized needs: Analysis of data and observations collected from resources throughout the state. Matheny’s mission: To provide exceptional care and an optimal quality of life for children and adults with special needs and medically complex developmental disabilities. Matheny’s vision: To be the recognized model of excellence in the field of developmental disabilities. Our Goal: To deliver exquisitely safe, high quality care to every patient, every day. This report describes our processes and findings in assessing our community’s needs. We sought to elucidate perceptions of patients, families and other organizations regarding the medically complex developmentally disabled people living in New Jersey. We also sought to build upon previous needs assessments performed by Matheny and explore opportunities that may help meet the unmet needs of our patients and clients. According to the New Jersey Division of Developmental Disabilities (DDD) there are approximately 25,000 individuals living with developmental disabilities in our State. Somerset County reportedly is home to approximately 1,300 developmentally disabled individuals. Of note, approximately 400 developmentally disabled people are noted by DDD to be receiving services out of state, with 362 of those individuals receiving out of state residential services. 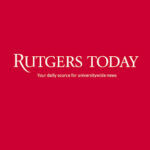 DDD reports that the majority of developmentally disabled people in New Jersey live at their family home. This population also resides in: DCA-licensed homes, developmental centers, group homes, skilled nursing facilities, special hospitals, state psychiatric hospitals, supervised apartments, and other supportive housing. Matheny serves clients from 19 of the 21 counties in New Jersey, with the largest groups coming from Somerset (19.4%), Essex (12.3%) and Morris (9.0). [Table 1] 101 of these clients are inpatients at Matheny’s Special Hospital, which is licensed by the New Jersey Department of Health and Accredited by The Joint Commission. 30 adults reside in Matheny’s community residences. Eleven students attend The Matheny School but live at home. The Schools’ total enrollment is 45 students. We also care for several outpatients who utilize our dental services and sub-specialty medical services. The great majority of Matheny inpatients and group home residents have cerebral palsy as their primary diagnosis. In addition to cerebral palsy, our patients may have other associated clinical conditions such as vision and hearing deficits, seizure disorders, intellectual disabilities and dysphagia, with resulting aspiration problems. Matheny also cares for patients with spina bifida, Lesch-Nyhan Disease (LND) and a wide range of uncommon neurological conditions including Rett syndrome, Angelman syndrome, Cornelia de Lange syndrome, Wolf-Hirshorn syndrome, 4Q deletion syndrome. Lesch-Nyhan Disease is a rare x-linked recessive disorder associated with cognitive impairment, high levels of uric acid in the blood, kidney involvement, and the hallmark symptom – involuntary self-injurious behaviors. Matheny is recognized as one of the leading sources of information on care issues regarding Lesch-Nyhan Disease. The Atlantic Health Developmental Disabilities Centers are part of the Center for Human Development at Morristown Medical Center. The DDC offers diagnostic and treatment services for adults with developmental disabilities. Its staff includes board-certified internal medicine physicians and nurse practitioners who collaborate with developmental pediatricians, neurologists, psychiatrists, clinical nurse specialists, psychologists and licensed professional counselors to provide comprehensive, integrated primary care and behavioral health services. Any adult with a developmental disability is eligible for DDC services but needs to be registered with the New Jersey Division of Developmental Disabilities (DDD). Patients include individuals who live with their families or in their own homes, supervised apartments, skills development homes with sponsors, or group homes with staff. DDC medical developmental disabilities services include: comprehensive medical and neurological evaluations; coordination of care; dental care; hospitalization at Morristown Medical Center or Overlook Medical Center with coordinated follow-up care and discharge services; neurological examinations and testing; primary health care for acute and chronic illness; referrals for genetic counseling and birth defects diagnosis and counseling; referrals for subspecialists (cardiologists, dermatologists, orthopedists, etc. ); workshops and educational programs focusing on the special needs of people with developmental disabilities. The facility also provides behavioral health developmental disabilities services, and, at its child development and autism centers, provides pediatric developmental disabilities services as well. The Robert Wood Johnson Department of Family Medicine and Community Health operates the New Jersey Primary Care Research Network, a practice-based research network of nearly 120 primary care practices, more than 300 physicians, and approximately 750,000 patients. Participating practices are located throughout New Jersey in a variety of urban, suburban, and semi-rural settings. The Summit Medical Group employs more than 550 practitioners who support more than 80 medical specialties and services. In addition, SMG supports medical research to identify best treatments and practices for patients. Pleasant Run Family Physicians in Neshanic Station, NJ provides care for patients of all ages, from newborns to geriatrics. It is part of the Atlantic Accountable Care Organization (AACO), a joint venture of Atlantic Health System and Valley Health System. It encompasses more than 1,800 physician participants in four regions of northern New Jersey, including Bergen, Morris, Sussex, Union, Hunterdon, and Somerset counties. The Richard Hall Community Mental Health Center in Bridgewater, NJ, is part of the Somerset County Department of Human Services. Its Office on Aging and Disability Services is a designated Aging and Disability Resource Connection (ADRC), designed to streamline access to long-term care support services, health promotion, and education. It links seniors, their caregivers, and adults with disabilities to the programs and services needed to remain independent and active in the community. Trinitas Hospital Behavioral Health Services is a comprehensive department of behavioral health and psychiatry operated by the Trinitas Regional Medical Center. Services are offered along with a full continuum of care, with specialized services available for adults, children, adolescents, and their families. In addition to operating a 95-bed inpatient facility for the adult, child/adolescent and mentally ill/developmentally-disabled persons, the hospital provides almost 200,000 behavioral health visits in a typical year. 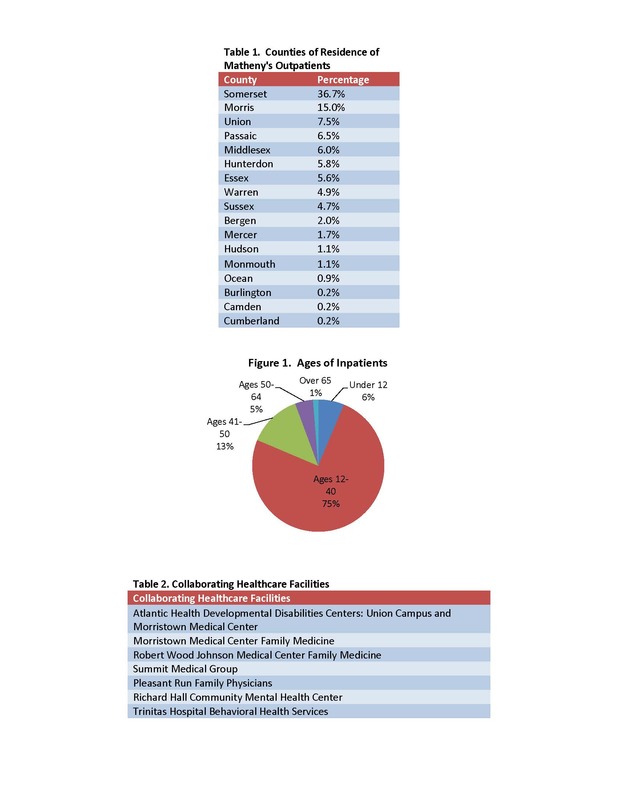 To determine how the health needs of people with disabilities in the state of New Jersey are being met, Matheny surveyed 51 agencies. Fourteen of those agencies (27.4%) responded, but only seven identified themselves. 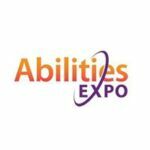 They are: Abilities of Northwest New Jersey, Inc.; Alternatives, Inc.; Center for Family Support New Jersey; LADACIN Network; North Jersey Elks Developmental Disabilities Association; Princeton Child Development Institute; and Progressive Comprehensive Services, LLC. Availability of adaptive equipment and devices. Case management, health and wellness, and mental health therapy and psychiatry. Mental health services for people with physical disabilities. 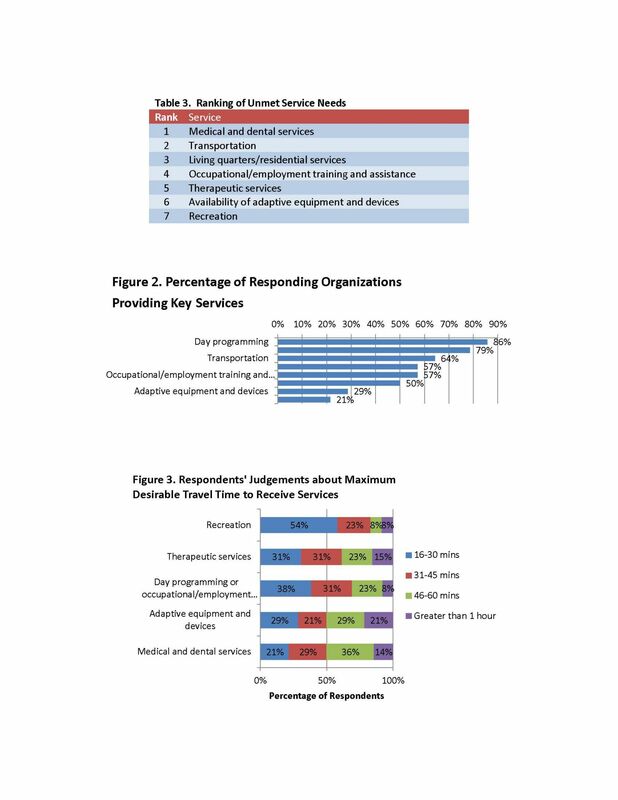 Respondents were asked about the distance people with disabilities will travel for key services. See Figure 3. Adaptive equipment and devices: 16-30 minutes, 28.57%; 46 minutes-one hour, 28.57%; 31-45 minutes, 21.43%; greater than one hour, 21.43%. Therapeutic services: 16-30 minutes, 30.77%; 31-45 minutes, 30.77%; 46 minutes-one hour, 23.08%; and greater than one hour, 15.38%. Recreation: 16-30 minutes, 53.85%; 31-45 minutes, 23.08%; 46 minutes-one hour, 7.69%; greater than one hour, 7.69%. St. Luke’s University Hospital, Bethlehem, PA; Hackettstown Medical Center, Hackettstown, NJ; Premier Health Associates, several locations in Sussex and Warren counties, NJ; Children’s Specialized Hospital, New Brunswick, NJ; Children’s Hospital of Philadelphia; Robert Wood Johnson Somerville, New Brunswick and affiliated networks; Bergen Regional Medical Center, Paramus, NJ; Morristown Medical Center, Morristown, NJ; Trinitas Regional Medical Center, Elizabeth, NJ; Jersey Shore Medical Center, Neptune, NJ; Community Medical Center, Toms River, NJ; Monmouth Medical Center, Long Branch, NJ; Capital Health Centers, Trenton and Pennington, NJ; Princeton Healthcare Center, Princeton, NJ; Hunterdon Medical Center, Flemington, NJ; St. Mary’s Hospital, Passaic, NJ; St. Joseph’s Hospital, Paterson and Wayne, NJ. Age Breakdown of People with Disabilities Served See Figure 4. 50.00% of respondents serve more than 100 individuals between the ages of 21 and 64. 30.00% serve more than 100 infants and children under four years old. 25.00% serve children and adolescents, ages four through 20. 15.38% serve adults 65 years and older. 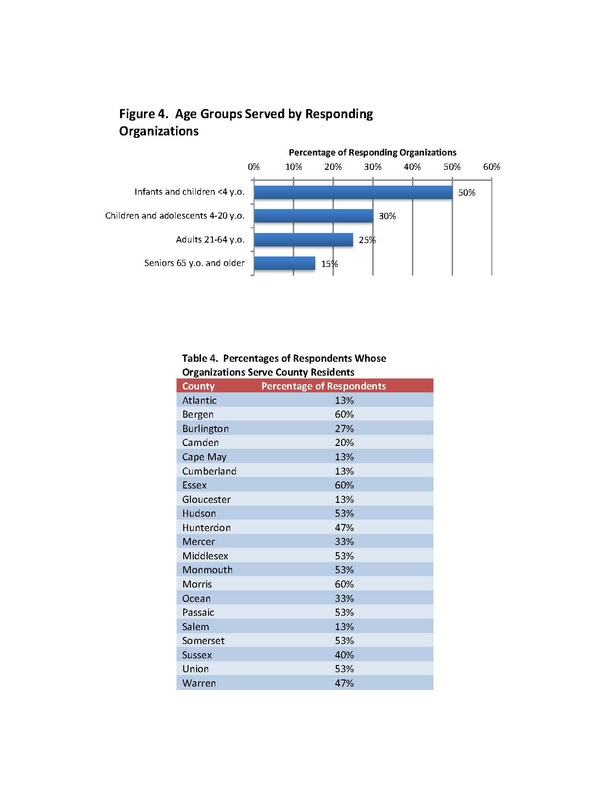 60% of respondents serve people in Bergen, Essex, and Morris counties. 53.33% serve people in Hudson, Middlesex, Monmouth, Passaic, Somerset, and Union counties. 46.67% serve people in Hunterdon and Warren counties. 40.00% serve people in Sussex County. 33.33% serve people in Mercer and Ocean counties. 26.67% serve people in Burlington County. 20.00% serve people in Camden County. 13.33% serve people in Atlantic, Cape May, Cumberland, Gloucester, and Salem counties. 50.00% of respondents serve more than 100 individuals who live in a family, relative or friend’s home. 16.67% serve more than 100 individuals who life fully independently. 8.33% serve more than 100 individuals who live in a private home/apartment with part-time assistance from formal (paid) or informal (family/friend) caregivers. 8.33% serve more than 100 individuals who live in a private home/apartment with full-time assistance or supervision. 7.14% serve more than 100 individuals who live in a group home. 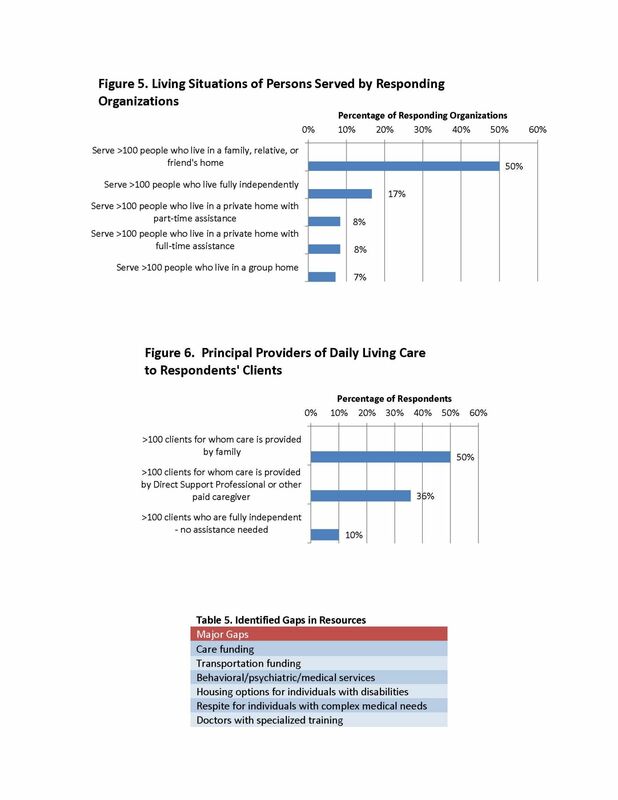 35.71% serve more than 100 individuals whose primary care provider is a direct support professional or other paid caregiver. 10.00% serve more than 100 individuals who are independent, i.e., do not require assistance. Housing options for individuals with disabilities. Respite for individuals with complex medical needs. In 2014, the Arc of New Jersey Family Institute conducted a survey among the families it served. One of the questions was: If you could change two things about the system or services for people with intellectual or developmental disabilities, what would that be? “Assignation of a case manager from birth to help families navigate the system. Recognizing that its ability to provide medical and therapy care for the disability community in New Jersey is limited, Matheny does everything it can to train future professionals in the field. This includes training and education of medical students, nursing students, and students in the various therapies. Approximately 170 undergraduate third year Rutgers New Jersey Medical School medical students from visit Matheny annually during their pediatric clerkship. They get a 6.5 hour experience, totaling 1,112 “student-hours” of training provided per year. The students receive exposure to an interdisciplinary approach to providing care to the medically complex developmentally disabled patient. They meet with Matheny’s medical staff, speech therapists, dieticians, personal care assistants, arts program staff, our research director, social workers and adult services staff. They also receive patient contact, including persons with Lesch-Nyhan Disease. In the context of a standardized patient exercise, the students conduct clinical interviews with patients who communicate in ways other than verbal. A study published in Academic Medicine confirmed the short term impact on students’ attitudes and perceived readiness to serve persons with complex developmental disabilities. Overall student evaluations of the one-day experience have consistently placed Matheny’s program among the most highly rated pediatric clerkship experiences. Residents in adolescent medicine at the Morristown Medical Center visit Matheny for exposure to medically complex patients with developmental disabilities. Approximately 10 residents rotate per year, each for about 2.5 hours, totaling 25 hours of training. The residents meet with Matheny’s research director, medical staff, a dietician, and a physical therapist. Approximately 130 undergraduate and graduate nursing students from four NJ educational institutions – Raritan Valley Community College, Passaic County Community College, Seton Hall University, and Union County Vocational Technical High School spend more than 4,300 hours per year training at Matheny. The nursing students from Raritan Valley Community College and Passaic County Community College complete their pediatric clinical rotations at Matheny, spending 12 hours a week on the hospital floor. Nursing students from Seton Hall receive training at Matheny’s Adult Learning Center in Hillsborough as part of the community nursing program at the university that requires Bachelor of Nursing candidates to spend time at a variety of community nursing settings. Matheny also helps educate graduate nursing students from Seton Hall during clinical rotations and has participated in their thesis development exercises. High school students at Union County Vocational -Technical High School shadow nurses throughout the day as preparation for a career in medicine. All of the students learn unique skills such as how to communicate with non-verbal patients and how to dispense medications to people with complex disabilities, so they will be prepared if they later encounter persons with disabilities in other care settings. In 2015, therapy majors from 19 US colleges and universities performed more than 2,000 hours as interns at Matheny in occupational, physical, speech, music and recreation therapy. The participating institutions were: Bloomsburg University, East Carolina University, East Stroudsburg University, Eastwick College, Elizabethtown College, Florida State University, Ithaca College, Kean University, Marywood University, Misericordia University, Monmouth University, Montclair State University, Northeastern University, Rutgers University, Shenandoah University, Southern Methodist University, University of Scranton, University of Miami, and Winston-Salem State University. Matheny also has an active internship program for social workers. The internship requires approximately 500 hours of supervised clinical clerkship with our patients. Colleges and universities supplying interns in recent years included the College of Staten Island, Monmouth University, and Rutgers University. Transform our hospital into a data driven high reliability organization that delivers exquisitely safe, high quality care to every patient every day. Maintain our Accredited status with The Joint Commission. Coordinate our Arts Access programs with other similar organizations around the state. Continue to work collaboratively with healthcare educational programs across the State to improve the perception and ability of caregivers with reference to our population. Work with NJ resources to develop group homes for children and adults in the developmentally disabled community. Continue to work with advocacy groups around NJ to improve the standing of our population with regard to state and federal resources.